Last week when the weather was rainy and overcast Colt and I made a batch of Shrimp and Sausage Gumbo to warm the soul on a chilly day. Even though I'm far from southern I've always been drawn to the food and recipes. 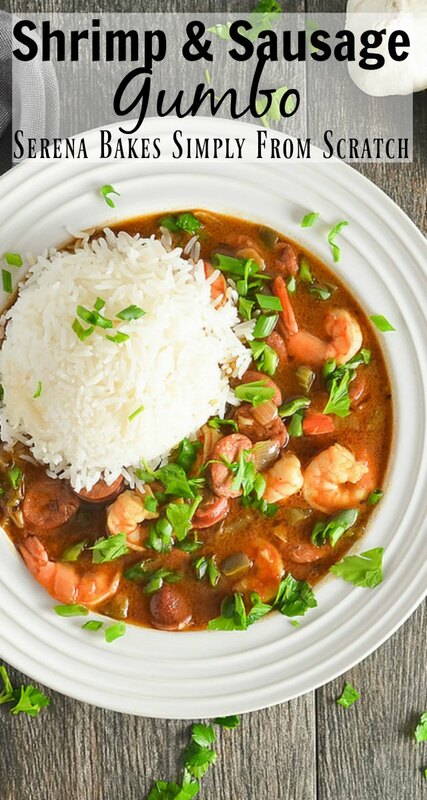 The long slow simmer of roux in Shrimp and Sausage Gumbo is an important step to building a rich, smokey, mahogany roux, with fabulous flavor. It's not a dish to make when your in a rush, but well worth the time spent to build the flavors. 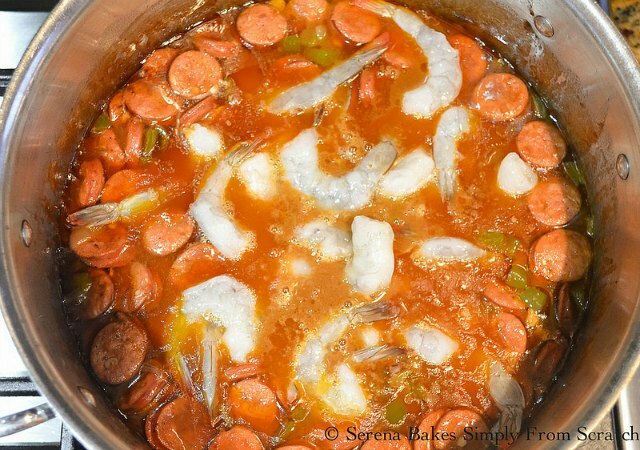 I can't promise this recipe for Shrimp and Sausage Gumbo is authentic since I'm a Northwest girl, but I can promise you the taste will tantalize your taste buds, and leaves the memory lingering long after it's gone. 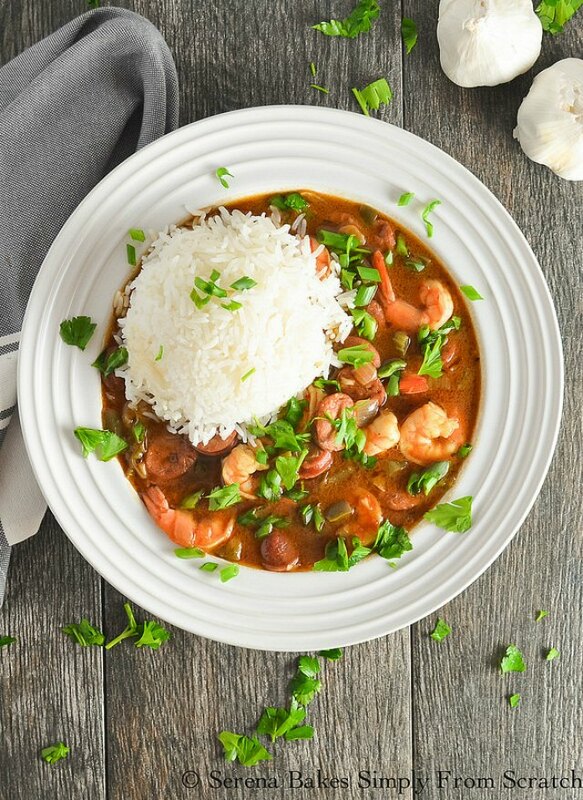 Shrimp and Sausage Gumbos a fun way to celebrate Mardi Gras without leaving the house, and a great excuse to invite company over to enjoy. 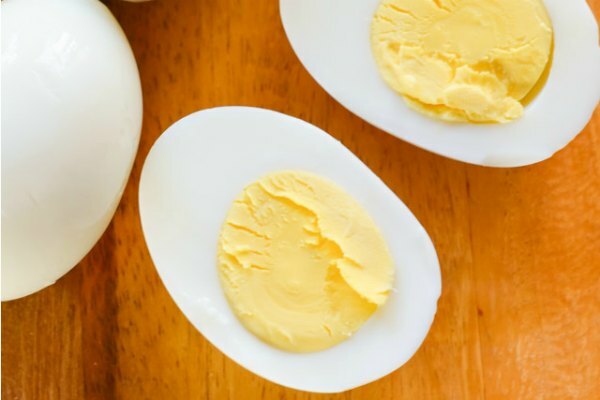 Melt 1/4 cup Butter and 3/4 cup Cooking Oil in a heavy duty deep skillet or large cast iron pan over medium heat until oil is hot and butter is melted. 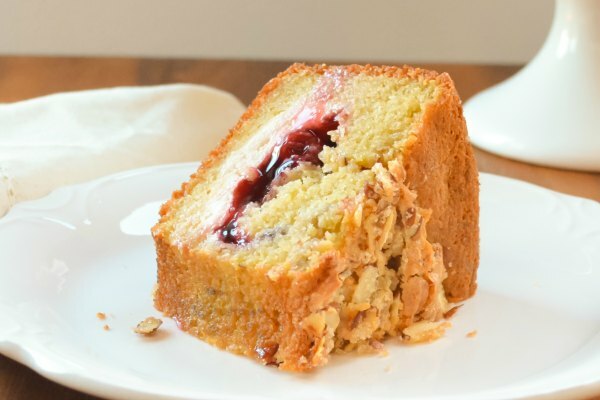 Sprinkle in 1 cup All-Purpose Flour while stirring. 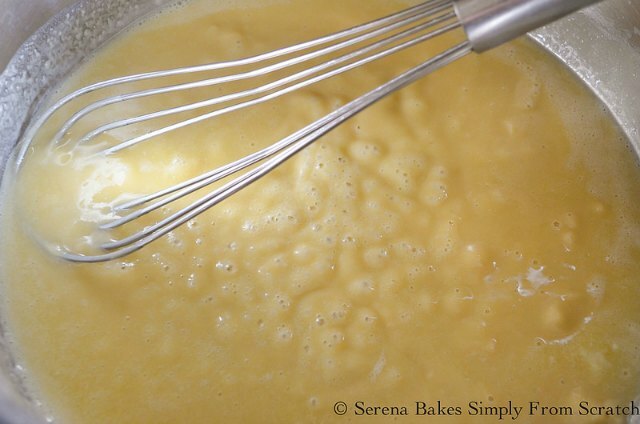 The secret I've found to a good roux is a long slow simmer. That is why a heavy pot is so important to maintain even heat distribution, and prevent burning. 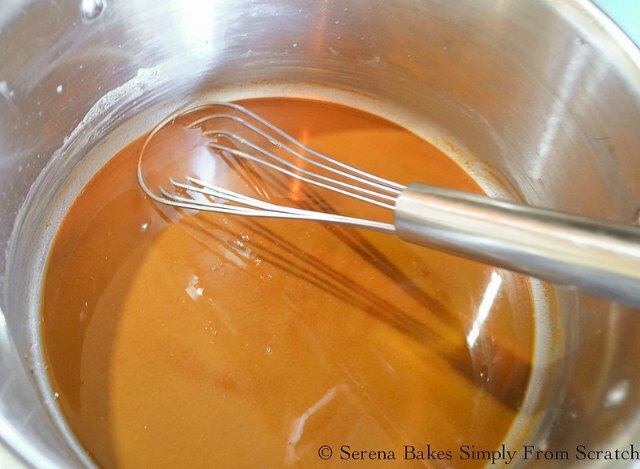 Cook roux for about 30 minutes stirring frequently to prevent burning until roux is a dark mahogany brown like chocolate. If the roux at any point has black bits it's burnt, and will need to be restarted so it's important to keep an eye on the roux to achieve the proper color without burning. Also if roux starts to smoke remove it from heat for a few minutes to reduce temperature. The roux was much darker than the picture suggests, but do to using overhead kitchen lights the color is blown out. Stir until well combined and onion starts to soften. 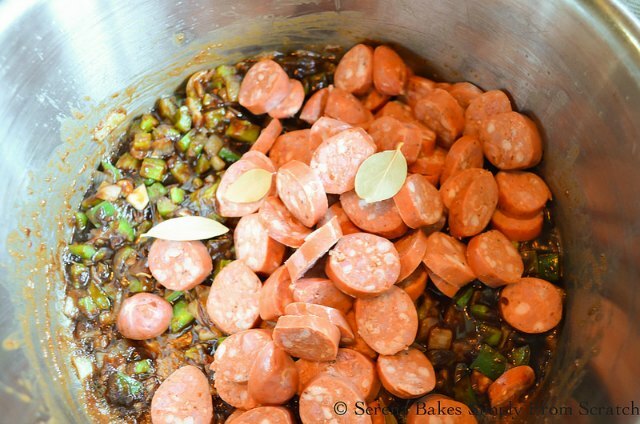 Add 1 pound Sliced Smoked Andouille Sausage, and 3 whole Bay Leaves. Slowly stir in 4 cups Chicken Stock and 2 cups Water. 1/4 teaspoon Cayenne Pepper or to taste. Bring to a simmer, cover, and cook for 45 minutes to an hour over low heat. Stir in 1 pound Peeled Shrimp, cook until shrimp are pink about 3-5 minutes. Add 1 tablespoon File Powder, stir until combined. 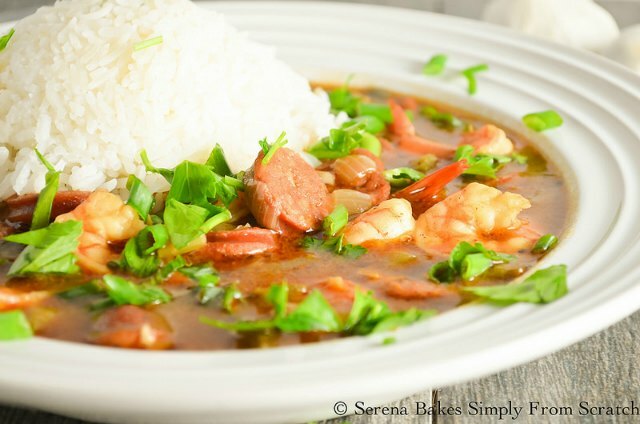 Serve Shrimp and Sausage Gumbo with a scoop of hot Rice. Garnish with fresh Chopped Parsley, and Green Onion. Shrimp and Sausage Gumbo is perfect comfort food on a chilly day and well worth the long slow cook time required for maximum flavor. 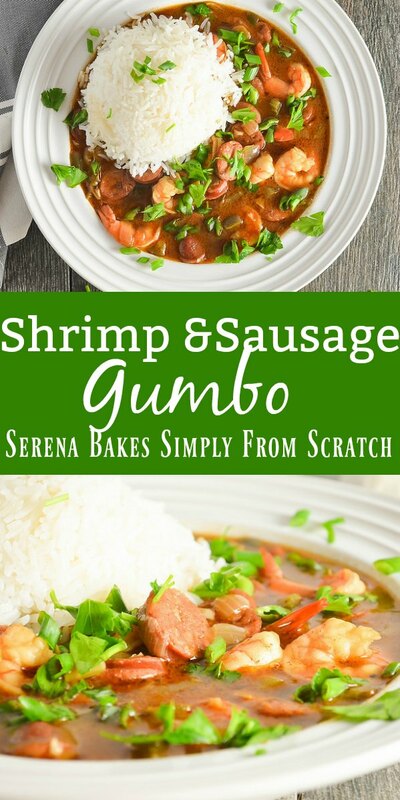 Shrimp and Sausage Gumbo is slow simmered and filled with lots of delicious flavor from Serena Bakes Simply From Scratch. In a heavy duty deep skillet or cast iron pan add butter and oil. Cook over medium heat until hot and butter is melted. Slowly sprinkle flour into oil while whisking. Cook mixture over medium heat for around 30 minutes until a deep, dark mahogany, chocolate color. Stir frequently for even color, and to prevent burning. If roux starts to smoke remove from heat for a few minutes to cool. If the roux burns it needs to be discarded and restarted. 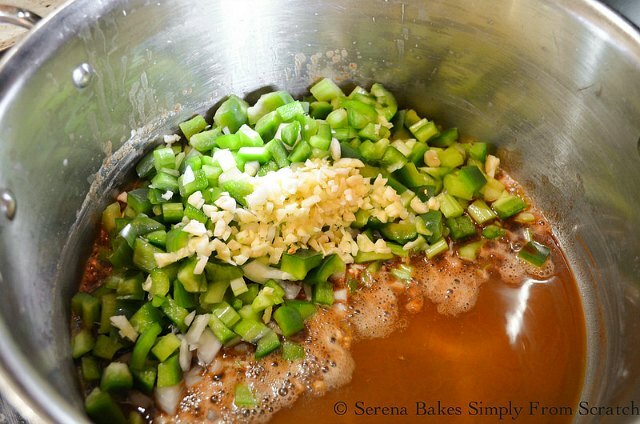 Stir in onions, celery, bell pepper, and garlic. Cook until softened. Add sausage and bay leaves. Stir until combined. Slowly stir in chicken stock, water, thyme, salt, smoked paprika, granulated garlic, and cayenne pepper. 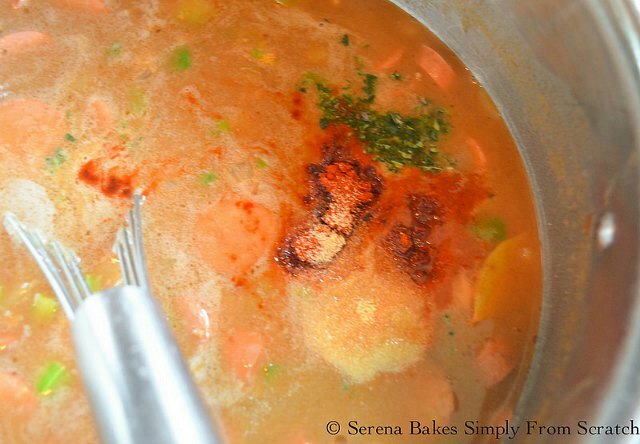 Bring to a simmer, reduce heat to low, cover, and cook for 45 minutes- 1 hour. Stir in shrimp and cook until pink about 3-5 minutes. Add file powder and stir until combined. 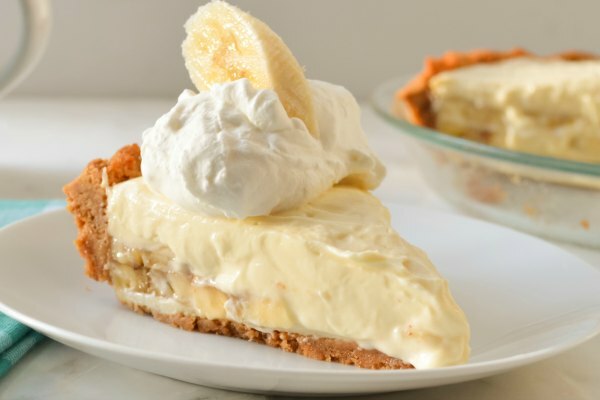 Serve with a scoop or rice. Garnish with fresh parsley and green onions. Omg it tastes great! I only added creole seasoning. Thanks!